We are a leading service provider for the Jewellery Authentication Report. We are highly regarded for the most authentic and accurate Diamond Jewellery Certification services with regard to the Jewellery Authentication Report. Services offered by us are critically appreciated and are highly appreciated by our loyal client base, due to its swift delivery and bonafide quality. This service assortment finds application among the needs and tastes amongst our client base. 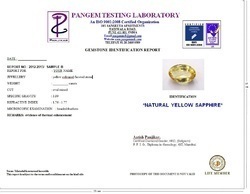 Looking for Jewellery Authentication Report ?